Tufted and hand stitched with rounded edges a French mattress has a special vintage look. Today, French mattresses are most often used on daybeds, sometimes on sofas, and occasionally for pillows. Originally though, they were crafted from striped cotton ticking, filled with cotton batting, tufted to keep the batting evenly in place, and given a welted edge for a smooth finish and durability. If you’ve ever gone to a flea market in Europe, you might have encountered old-fashioned metal beds with metal mesh across the frame to support the mattress. French mattresses were originally designed for that type of bed, which was portable. And being even in thickness, the mattresses could be rolled and tied for easy transport. Today, they are mostly used on daybeds, which don’t require bed linens. As upholstery the mattress can be as elegant and elaborate one that matches the cool white Neoclassical upholstered daybed [top] with elegant nailhead detailing. 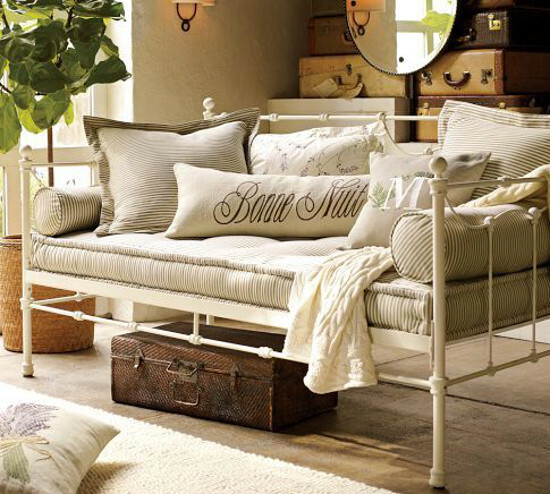 Pottery Barn went straight up on the vintage look with this metal, three-sided Savannah daybed with original French mattress ticking. Narrow ticking stripes mix easily with florals and almost anything else. The upholstered daybed mattress is sold separately and also can be used on a banquette where it’s comfortable for casual seating and napping. 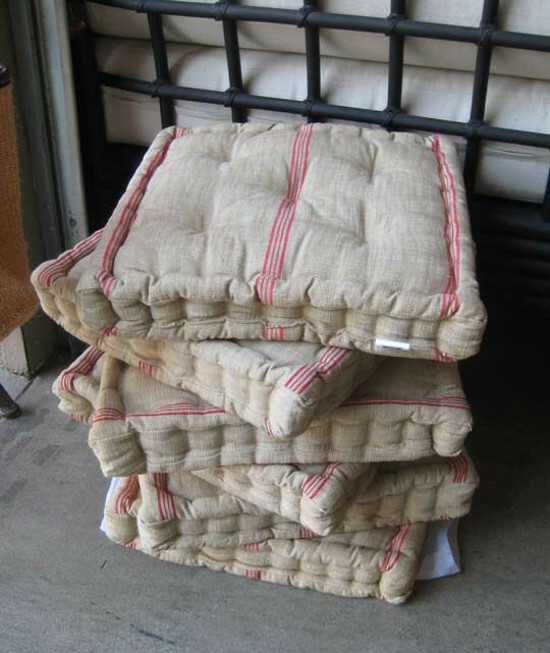 French mattress style pillows had their heyday in the grain-sack era a few years ago. These were reproduced in natural linen with red-stripe ticking that is still sold by the yard online and on ebay. 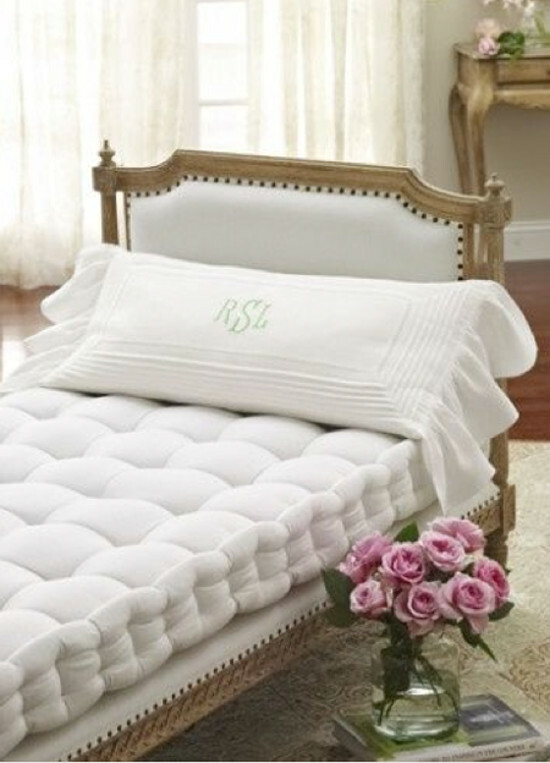 While casual fabrics are perfect for a French mattress, they can become more elaborate. This banquette sofa, built into a nook, ha an elaborate variation with wide tufting and sections that crown in between. It’s not your French great grandmother’s mattress but it’s pretty and offers a casual way to assemble seating that serves as a sofa without a major investment. And it’s a great look. French mattress style is awesome. I love the antique designs.